(P1) It should come as no surprise that kids are spending a lot of time in front of screens. (P2) According to a new study, tweens from 8 to 12 years of age spend an average of four-and-a-half hours each day watching TV or using a digital device. For teens 13 to 18, the average is six-and-a-half hours. But those numbers hide a bigger, more complex picture. (P4) Truth 1: Some teens spend too much time looking at screens. (P5) One in five tweens uses more than six hours of screen media each day, and 18% of teens are looking at their screens for more than 10 hours a day. Often they’re doubling up on screens, watching television on one while chatting with friends on another. (P6) Myth 1: This is the end of reading. (P7) While the average time young people spend reading, either in print or on a screen, is only 30 minutes per day, kids who took the survey say reading is one of their favorite activities. (P8) Truth 2: Boys prefer video games; girls prefer social media. 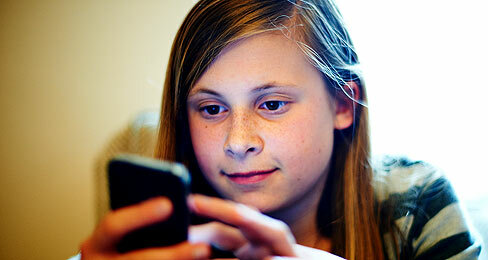 (P9) Among tween boys, 71% enjoy playing video games, twice as many as tween girls. And while more than 25% of teen boys list playing video games as their favorite media activity, only 2% of teen girls do. Teen girls, meanwhile, spend about 40 minutes more each day on social media than boys do. (P10) Myth 2: TV and music have been CROWDED OUT. (P11) For tweens, TV is still the top media activity. They enjoy it the most and watch it every day. In fact, 47% of tweens have television sets in their bedrooms. For teens, while 57% have TV sets in their rooms, music is the REIGNING form of entertainment. However, only about a third listen to music on the radio. Most teens listen to it on their smartphones. (P12) Truth 3: Gamers don’t get outside as much as kids who don’t play video games. (P13) Kids report spending about an hour each day being active. For gamers, that average drops to 47 minutes, the lowest for any kind of media consumer. Social media users are the most active, spending one hour and 13 minutes per day doing some form of physical activity. (P14) Myth 3: The Digital Revolution is making young people more creative than ever. (P15) So far, kids are too busy consuming to be doing much producing. Tweens spend an average of five minutes and teens nine minutes per day making something with all their digital tools, whether it’s art, music, or writing. Would you limit your children’s amount of media time? In some countries, even many young men in their 20s and 30s are completely obsessed by video games. Is this a social problem in your country? Why do boys like games better and girls like social media better? Do you feel that you watch too much television, or just enough?